Drag King Heywood Wakefield has been burning up the performance scene in Boston, MA USA since 2000. Led to the stage, in 1999, by his desire to rid his heart of the terrible pain of his divorce, Wakefield still finds solace in his ex-wife's favorite love songs. Stuck in his 70's wardrobe, Heywood is a wanna-be suave crooner in the body, and mind, of a middle aged father of a lesbian daughter who manages his career. Mr. Wakefield remains hopeful that love is out there for him. Heywood Wakefield mines the schlocky music oeuvres of Engelbert Humperdinck, Neil Sedaka, Neil Diamond, Barry Manilow, Dean Martin and many others from the 60's and 70's. His performances are high energy, full of pratfalls and blunders, outlandish dance moves he can barely navigate, and darkish charm. He's the guy you are embarrassed to watch but want to cheer on anyway. Occasionally Wakefield will attempt 'sexiness' but usually stumbles and ends up winning people over with his sad sap wit. When performing for younger audiences Wakefield often performs older songs covered by newer artists or new songs covered by schlocky artists, therefore sticking with his heart and bridging the gap between the decades. As a character who is a father, Wakefield is always aware of his surroundings and setting a good example of polite behavior. One of Wakefield's strengths as an MC is drawing the audience in and adlibbing with them. He can often be found in the audience with his cordless microphone talking with people and joking around with them. Wakefield often discerns who is new to town or single in the room and tries to introduce them to their neighbors. Heywood Wakefield is the mastermind behind TraniWreck, Boston's most irreverent drag cabaret show and Wreckage the contest/show "likely the most surreal event Boston has to offer, remains a must see, where creativity and eccentricity rule the night." Bay Windows. 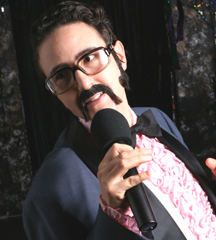 Drag King Heywood Wakefield was the creator and host of Boston's longest running Drag King and Karaoke show, Glitter Switch: Drag / Karaoke where he welcomed novice and seasoned performers and karaokers to the stage. Wakefield performs all over the country in venues large and small and at universities. He MC'd Dragdom at The International Drag King Extravaganza in Austin, TX in 2006 in front of 1200 people, and has produced and MC'd the Wellesley College Dyke Ball for 2006 and 2007. He's preparing to MC RISD's Drag Ball in April 2007. Wakefield has taught Drag King workshops and gender performance classes in clubs, universities and in private. Check out the press section for accolades about Heywood Wakefield and his shows. Heywood Wakefield is the creation of Aliza Shapiro, a Boston based events producer (Truth Serum Productions) and architectural designer. She was featured on Stuff@Night's Hot List in October 2003 and 2004, their Players of the Nightlife list 2004 and 2005, Boston Magazine's "hot list of rising stars" 2003 and was featured in the Boston Herald in 2002 and 2005. Aliza can be reached at aliza @ truthserum . org and more information can be found by cruising the links above. Click on the photo to the left above to find high quality downloadable images. Please see photos section for more history and images. Heywood Wakefield has been teaching his drag king workshop called Strap it down! Pack it in! at universities and other venues around New England and NY. If you'd like him to come to your school or town, email us and we'll make it happen. "Strap it down, Pack it in: Drag King / Masculine Performance workshop with Heywood Wakefield"
Want to be a King for a night? Want to add some swagger to your personal gender expression? Or create a character for your fantasy role-playing repertoire? Whether you want to hit the stage, hang out with the guys at the local pub, or fulfill a fantasy in the bedroom, it's all gender performance! Maybe you're a butch just looking for some fun, or an FTM looking for realistic facial hair tips. Maybe you're a femme wanting a walk on the other side of the gender spectrum, or a MTF looking for a gender bending experience. This workshop can help you harness masculine power and the privilege of Royalty. Boston's premiere professional Drag King, Heywood Wakefield, will teach you the art of binding, packing and passing. The workshop will cover identity creation, make-up and costuming, physical manifestations of masculinity, and a discussion of masculinity and drag performance history. We'll provide the necessary make up and facial hair materials, you provide your characters' attire. After registering for the workshop a list of suggested/required materials will be sent via email. After the workshop we'll head out to a cultural event or local bar and practice our skills. And while we're not talking exclusively about drag performance for the stage, workshop attendees will also have the opportunity to perform at Boston's renowned Wreckage: The Contest Show. or email heyyou @ truthserum . org (but close the spaces) to register for classes, ask questions, or volunteer.